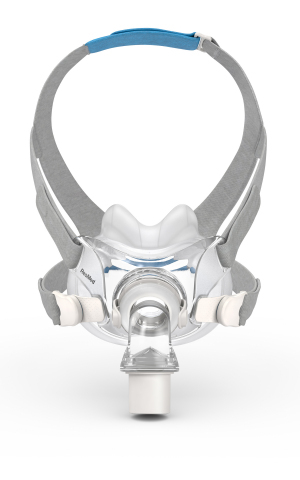 ResMed (NYSE: RMD) (ASX: RMD) today introduced its first minimal-contact full face CPAP mask, AirFit F30, the latest addition to its AirFit mask portfolio, which helps users reduce facial marks, wear glasses in bed and curl up closer to their bed partner. Unlike most traditional full face mask cushions, AirFit F30’s sits below the nasal bridge, preventing top-of-the-nose red marks and irritation, and reducing feelings of claustrophobia for some full face wearers. AirFit F30 also features ResMed’s latest QuietAir vent, so it’s quieter than ambient noise in the bedroom. Plus, magnetic clips make the mask fast and easy to put on and take off, while a one-size-fits-all headgear ensures an accurate, first-time fit. With just two cushion sizes and one headgear, AirFit F30 fit 93 percent of users in a ResMed study.2 Fast and accurate first-time fittings with fewer stock keeping units (SKUs) can help home medical equipment (HME) providers achieve higher patient satisfaction, successful patient setups and simpler inventory management. AirFit F30 will be available later this year in select countries. It will be on display this weekend at the European Respiratory Society Congress in Paris at ResMed’s Booth J.04. 1 ResMed Clinical Study of 21 Australian patients comparing ResMed AirFit F30 and Phillips Respironics Amara View conducted April-May 2018. AirFit F30 and Amara View are both tube-down, minimal-contact, full face masks. 2 ResMed Fitting Study of 75 U.S. patients comparing ResMed AirFit F30 and Phillips Respironics Amara View conducted April-May 2018. AirFit F30 and Amara View are both tube-down, minimal-contact full face masks. 3 Philips Respironics Amara View user manual. 2016; ResMed AirFit user guide. 2018.